In business, I’m constantly looking for ways to spend time to save time. I spend my time learning how to do repetitive tasks more efficiently. As a consultant, I’m conscious of every shift, click and keystroke. Little changes, multiplied by the millions of shifts, clicks and strokes we will do in our lives, can add up to be powerful time savers. In the past, I’ve been guilty of taking pride in my inability to learn how to work more efficiently. Obviously, I wouldn’t rationalize my pride in that manner. Rather, I would tell myself that I was carefully handcrafting my work. In reality, I was spending hours and hours repeating tasks in an inefficient manner. Today, I’ll share the coaching hacks that have freed me up from my screen. 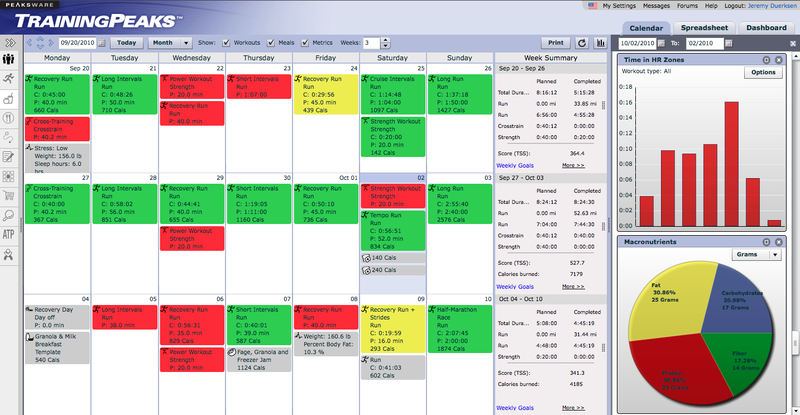 I use a two-screen set-up for building training plans. My main screen is 27-inch Apple Cinema Display that enables me look at six weeks of two athlete calendars side-by-side on TrainingPeaks. My second screen is a 13-inch monitor, which I use to view my athletes’ annual planner, a Google Doc I’ve created for them where I can see their races, travel and weekly structure tips on a single page. In addition, I use an Apple Magic Mouse (wireless) with a full-size (wired) keyboard. This hardware set-up saves me hundreds of hours each year. I value my work time at $100 per hour, so the payoff is huge. Even if you are coaching for minimum wage, you cannot afford to waste time with inefficient workflow. Time is best spent meeting your athletes’ needs, educating yourself, sharing your knowledge, or elsewhere in your personal life. 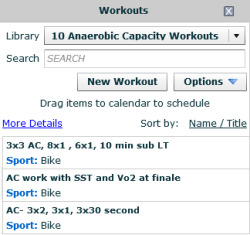 In TrainingPeaks’ Training Plans section, you can find an exercise library that I built for the USAT coaching education program (it’s free). My total library extends to 500 workouts, but that doesn’t matter. What matters is being able to quickly apply the correct workout, to the correct situation, in a way that an athlete can execute. In one month, you’ll have your key workouts from your favorite sport entered into your library. Move onto the next sport, then the next. Remember that the way your sort your library isn’t important. What matters is being able to quickly apply an appropriate workout in a way that the athlete can execute properly. You likely have a limited number of athlete sub-types that gravitate to your coaching. If you look closely then you will find that much of your coaching is the same basic template given to similar athletes. Even if you store everything in your head, the brain works via templates and arrays! Time spent customizing your basic template is far more valuable to your team, than time spent repeating the same workouts from memory. The purpose of creating templates is to free time for value creation when you’re not “dragging boxes” on TrainingPeaks. Build your athlete plans as six-week templates that address a specific phase for a specific athlete (create a training plan and title as such) – you will need my hardware set-up to see six-weeks properly. Learn how to apply (and un-apply!) your plans in TrainingPeaks – this only takes a few clicks. Learn how to highlight blocks of days (shift-click) and specific days (command-click or ctrl-click based on OS) – this will let you quickly clear out template days that aren’t required. Use your library to quickly drag & drop the personalized workouts that you want to apply. Use “list” view to add comments to tailor your standard workouts to the athlete’s specific needs. It takes times to learn these hacks but the payoff is huge. Remember to ask your team what you do best. Very few of us started coaching to drag boxes across a screen all day! You’ll end up with a better product delivered to your team, and have more time to focus on the areas that create value in your business, as well as your life. Gordo Byrn is the co-founder of EnduranceCorner.com and the co-author of Going Long. In addition to having been an elite long-course triathlete himself, Gordo has studied under some of the best coaches in the industry including Dave Scott, Mark Allen, Scott Molin, and Joe Friel.